The parents of Ireland's first set of sextuplets have said they were given the medical option to abort some of the foetuses. 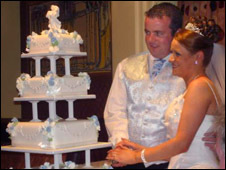 Nuala Conway, 26, of Dunamore, County Tyrone, gave birth to four girls and two boys 14 weeks early last month. She said 14 weeks into the pregnancy, doctors warned her and husband Austin of the risks of proceeding. "But we knew without discussion what we both wanted. These babies are a wonderful gift from God," she said. "Whatever God laid out for our lives, we were taking it," she told the Sunday Express newspaper. Abortions in Northern Ireland are still strictly limited and can go ahead only if it can be proven that the pregnancy would damage the physical or mental health of the woman. Mrs Conway's babies were delivered by a team of 30 people at the Royal Jubilee Maternity Hospital in Belfast and all arrived within the space of five minutes. The babies, conceived without the aid of IVF, weighed between 1lb 7oz and 2lb 2oz. The Conways have been keeping an almost constant vigil in the intensive care unit, where Ursula, Austin, Shannon, Karla, Eoghan and Kerrie are being cared for. Mrs Conway, who was discharged from hospital a week ago, revealed she had prayed for a child with her husband of three years. Initial scans revealed two babies and Nuala said they were "overwhelmed" at that. But further tests in February revealed the existence of four more babies. "It just didn't sink in at first. We were so shocked," she said. Now she says she just cannot wait to bring her ready-made family home. "I just feel lost without them. We have a house here but it feels so empty. It's not a home until all our babies are here safe and well," she said. "I'm in love with every single one of them. I fell in love when they were in the womb. When one moved they would all move and I could definitely feel 24 limbs kicking. "Every day seems like a year. Every minute seems like an hour. I just want time to go faster so they can get home. I just want to have a cuddle with them." Doctors at the hospital hope the babies will be strong enough to go home within two months - about the time they were due to be born. Mr Conway, a kitchen fitter, has suspended his job so that he can make the daily three-hour round trip to the hospital. He said: "It has been like a rollercoaster. The babies have been on and off antibiotics and ventilators. "They are thriving really well but it's hard to get a good day. There are so many of them there are always days when one or two will not be doing so well." 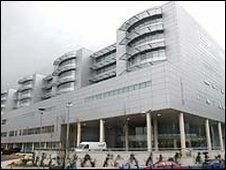 Dr Clifford Maynes, a neonatal consultant at the Belfast hospital, said the birth had taken "a massive amount of planning". "The biggest worry we had was if labour started in the middle of the night when we would not have been so prepared," he said. "The babies have all had normal head scans which is reassuring and have all made some progress, but it is still very early days. "The big objective now is to get them off drips and antibiotics and gaining weight." The Conway babies are the first recorded birth of sextuplets on the island of Ireland and the first in the UK since the Coleman sextuplets of Grimsby who were born in 1986.